Marcie Hershman’s writing is tempered with the wisdom that can only be gained through suffering. Her prose at times becomes almost poetic and lyrical. There is a simplicity to her writing which is slightly reminiscent of Herman Hesse’s work, however the actual content of her book lacks his depth. Her narrative is non-linear, strung loosely together by a monotonous central theme. She explores her relationship with her beloved brother, Robert, who died of AIDS. 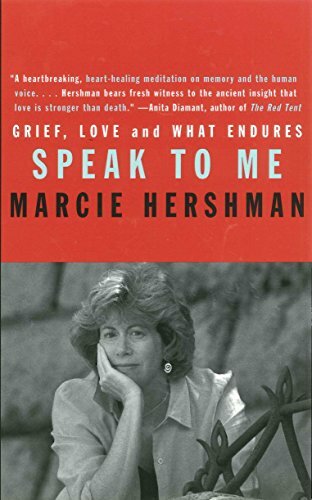 Hershman examines the roles his voice played, in life and death, in speaking and in silence. Its absence is delved into in relation to grief and denial. In the muting of his voice after death, she not only misses his voice, but hers in relation to his. The purpose of this small meditative book runs deeper than she realizes or ever probably will. The point of the book is ostensibly to eulogize her brother and to express her wish to hear his voice from the beyond. The force in her life that prompted her to take pen in hand is denial. She wants to deny the finality of death and she does so subtly. However, anyone with a close sibling can empathize with her. Hershman and her brother shared many traits, one of them being tenacity. Robert possessed an indomitable will. When they were children, their father chided him in an unduly harsh manner. He responded by standing up to his father, in manner that showed he possessed intestinal fortitude, especially in the era he grew up in, by talking back to his father. He then left the house without a sound. His parents began to panic as night fell. She searched for him on her bicycle, calling out his name louder and louder as she grew more and more concerned. Finally he was found to the joy and relief of his family. She notes that this stubborn streak was shared by most of her family, and it is evidenced in her work. Years later, they both discovered that homosexuality was one more of the traits that she and her brother shared. Ambition also bonded them closer together, as they both strived to achieve great things. As teenagers Hershman and her brother shared a passion for reading, though Robert tended towards European authors and she favored American writers. He went on to become a television producer, and she a writer. The flaw in her book is that she is using it as a vehicle for her denial. Even the most hardened atheist can not be blamed for addressing a few words at the gravesite of a loved one. On the other hand, the way she clings to her brother is almost pathetic. She is too poised to be immediately recognized as being desperate, but she embraces coincidence to bolster her belief in an afterlife. Her denial is so great that she believes her other siblings saw an angel enter her brother’s hospital room shortly before he died. She also treats a close friend’s near death experience and said friend’s supposed communication with dead relatives as fact. In conclusion, this book has dubious therapeutic value for the potential reader, as Hershman has not yet passed the first stage of mourning. The closure she so desires is an impossibility, for the dead can not speak. Chris Staheli is a student of psychology at QCC in New York. His interest in psychology was piqued by a high school course. He also studies philosophy. In his spare time, he writes poetry, weight lifts, and plays jazz and classical guitar.